Choosing a carpet cleaning company in Bensalem, PA can be a daunting task. How do you know who will really do a good job for you? Who can you trust? OxiGreen Carpet Cleaning has more than 25 years of experience in commercial and residential carpet cleaning. We have thousands of satisfied customers. With a reputation for great affordable carpet cleaning and a 100% customer satisfaction guarantee, we know you will be happy by choosing OxiGreen. Keeping your carpets clean will not only dramatically improve the appearance of your home or business. It will also create a healthier environment for you, your family, and your customers. According to the EPA, we spend almost 90% of our time indoors. Indoor air quality is directly related to the cleanliness of the environment. Keeping your carpets clean will keep things looking fresh and will keep you breathing easy. At OxiGreen Carpet Cleaning in Bensalem, PA, our 100% green carpet cleaning methods will decrease allergens, bacteria and dust mites in your carpeting. Because we use only safe, biodegradable cleaning agents, there is absolutely no toxic chemical residue left behind. That makes us your local pet and baby safe carpet cleaning company! OxiGreen’s affordable carpet cleaning is not only 100% green carpet cleaning, it is also very effective. Using modern carpet cleaning equipment, our IICRC certified technicians will remove the soil embedded deep in your carpeting, reaching debris and pollutants most vacuums and many carpet cleaners miss altogether. Our long-lasting, deep cleaning methods will lift and restore the matted traffic patterns and extend the life of your carpeting. Call OxiGreen Carpet Cleaning in Bensalem, PA today at 215-269-3331. We are happy to schedule a FREE in-home carpet inspection to assess and discuss your carpet cleaning needs with you. You may also visit us online at http://oxigreencarpetcleaningpa.com to learn more about our affordable carpet cleaning package deals and other residential and commercial services. 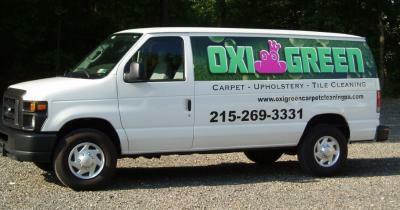 When choosing a carpet cleaning company in Bensalem, PA, choose OxiGreen. You’ll be glad you did. Enter you information below for a free no obligation quote.